"Wallasey," wrote Bernard Darwin in The Golf Courses of the British Isles, "is another course of mighty hills: indeed I do not think I have ever seen a course on which the contour of the hills and valleys was so infinitely picturesque." It's certainly true today, Wallasey still has its fair share of stunningly spectacular dunes, but they are fewer than in Darwin's day, owing to coastal erosion. Wallasey Golf Club is situated on the cusp of the Wirral Peninsula with views across the River Mersey. It's here, on the Wirral, that we start (or end) our journey after playing a host of classic links courses along England's magical northwest coastline - St Annes Old Links, Royal Lytham & St Annes, Fairhaven, Royal Birkdale, Hillside, Southport & Ainsdale, Formby, West Lancs, and then Royal Liverpool, which is also on the Wirral Peninsula. Old Tom Morris originally designed the course in 1891, but Wallasey was put on the map by one of its members, Dr Frank Stableford. Irked by his rising handicap, he developed the Stableford scoring system following a discussion with Duncan Taylor whilst walking down the 2nd fairway. In 1932, a competition at Wallasey took place utilising his new-fangled scoring system - the rest is simply a blob in history! The opening five holes are engaging and immense fun, with several raised plateau greens and elevated tees. Long, straight driving is key to scoring well, because Wallasey is a lengthy challenge, measuring more than 6,500 yards from the back tees. On the surface, 6,500 yards doesn't seem long, but factor in the wind, and this will test the very best. 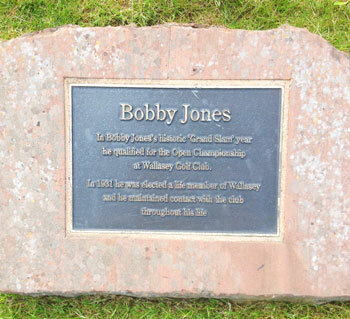 Wallasey hosted Open Championship Qualifying when the Open returned to Royal Liverpool in 2006, although nobody was able to repeat Bobby Jones's amazing feat. 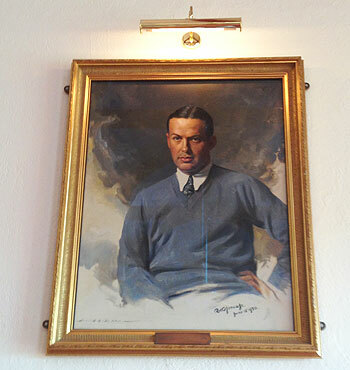 In 1930, Jones came through Open Championship qualifying at Wallasey and went on to win the Open at Hoylake. It was a good year for Bobby Jones. In 1930, he won the British and US Open Championships, the British and US Amateur Championships. After that, he retired. Who can blame him? "It is quite likely that we have played very far from well," wrote Darwin, "since this country of mountains and deep dells is always difficult for the stranger, and our host has probably ways and means of reaching the green that we are apt to regard as ways of darkness, but we have found the golf infinitely pleasant and exhilarating." We walked into the pro shop to hear a 5 handicapper say to the Pro that he shot a brilliant round and couldn't play any better. The Pro behind the counter asked what he shot gross and the player replied "16 over". I knew then that we were in for a tough round. I would say we played the Wallasey in a 4-5 club wind and to this day is probably the windiest round of golf I've ever played. It was such a shame because I absolutely loved the course. The first tee had a 90 degree wind from left to right. I struck a perfect drive straight and a bit left and ended up 40 yards right of the fairway. There was a lot of incredulous chuckling over what we had to look forward to. The course is absolutely brilliant and has so much variation. There are doglegs, really thin fairways, expansive fairways, stunning coastline views, hugely elevated tees, blind shots, sloping greens and is also in excellent condition. There are so many standout holes it is difficult to list them. The tee box on the 4th is something special though and makes the heart flutter. Add in some amazing dunescape and you have superb course. I would love to come back and play the Wallasey again and hope that the wind was not quite as strong. Played Wallasey in the Pairs Open on a fine July morning and I have to say that I was blown away by it. How on earth this course isn’t rated better is beyond me. I would go so far as to say that this is a better course than Royal Liverpool. This sentiment was echoed by several people I have subsequently talked to about Wallasey. The course is not a long one but the variety of holes, the routing and the shaping of the course is simply magnificent. The course was in great nick and the greens ran very true but weren’t lightning fast which they could have been. I would go back in a heartbeat. Top marks from me. One of the features at Wallasey is playing your second shot at many of the par fours to raised greens, and it is a couple of these that provide the best holes. The third, aptly named 'Valley', is an excellent hole where first you must thread your drive between a corridor of large sand dunes before rising up to the green high above. Prior to that the first eases you into the round with a tee-shot that restricts you from hitting driver and has a green slightly hidden away whilst the second is the longest par four on the course sweeping to the right but with a couple of well-placed bunkers preventing you taking the shortest route. 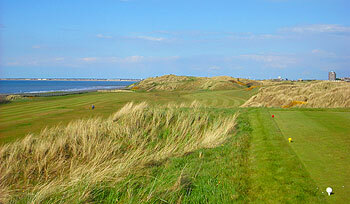 One of the best views on the course is that from the fourth tee which sits atop of the highest dune on the links. As you make your way from the third green it suddenly appears before you, a magnificent sight with the sea and beach on the right and an arching fairway well below - similar to that from the fifth tee at Silloth on Solway but perhaps more picturesque. The 11th is the best hole on the course, and wouldn't look out of place at any of the Open Championship venues, with a similar drive to the third then an elevated approach to a two-tiered green encompassed by trouble on all sides. You also play to greens high above at the 10th and 15th. The second shot into the 10th - a short but severe dog-leg hole - can be a terrifying shot, especially if played into the wind, as anything short could come back 60 yards down the fairway towards you. Meanwhile, the 17th is a long par four played into an enclosed green that may not be visible unless you are on the centre or left of the fairway. Once on the 18th tee everything becomes a little bit clearer about the architecture of this hole. The landing area is actually fairly generous before it filters into the slither of fairway you see from the behind the green. You are benefitted by having a beautiful church tower in the background as your ideal line from the tee. The green is slightly angled and set in a shallow bowl in front of the clubhouse. Wallasey is one of my favourite courses. It's not big and bold like a Royal Birkdale or Saunton (East) but is more intimate and picturesque. It's not an overly long course either but despite all the undulations it's a fair one and you usually get what you deserve. It is such a fun golf course to play with an endless variety of shots required to hit into the greens, especially the ones set high in the dunes. I played this historic links on July 12 on a breezy but sunny evening. I paid GBP 45.00 (half-price) using the online booking system on the website and the course more than justifies this price. Living relatively close by I had been keep to follow in the footsteps of Stableford for a while. On arrival a group of members were waiting on the 1st tee and cheerily beckoned me to tee off as I was playing hans solo. Without a warmup I managed to get a good drive away and tried my best to come up with a witty riposte as they joked that I better not slow them down! After stiffing my pitch I could relax on the 2nd tee and then ‘enjoy the walk’. Whilst being shorter than its Royal neighbor I found Wallasey trickier and ultimately more fun. The course reveals itself on the 4th tee and what a fantastic hole awaits matched by the 17th coming back in the opposite direction. The par 3s are fantastic with elevation changes and not overly long (apart from 16 which played into its teeth) and personally I prefer this. Holes 6,7,13 and 14 are in the flatter land away from the sea and whilst not as exciting as the others, I scored very well here being -2 for the four holes. The respite from elevation changes and mentally taxing shots was temporarily welcomed. However, every great course has a strong finish and 15-18 are just that. I saw a friendly fox on the 18th tee which improved what is an already fantastic view. The green overlooked by the old clubhouse and golfers supping on the patio makes for a fitting end to a fantastic golfing experience. The course was in good, not fantastic condition but playing here is all about the true links experience. My new favorite course in Cheshire. As I play most of my rounds solo I am often let through. It immediately becomes a 17 hole course as I always stuff up as I rush through. I need some work on my witty ripostes though - I always act cheerful as I snap hook my drive or hit my 8 iron massively fat 45 metres- what was yours? And yes, it certainly "pays" to check out what's online as the green fees section often neglect to mention twilight rates etc. I’d had Wallasey on my hit list for a long time so it was a real shame that the weather didn’t co-operate when I finally got round to playing here last week because it rained rather heavily during my round. Nevertheless, as my previous excursion to play on the Wirral at Royal Liverpool had been somewhat underwhelming, I’m glad to report my latest visit to the area was a far more satisfying, if slightly soggier, experience. There’s a lot of good golf going on out there amongst the sand hills, particularly on the stronger back nine. I wasn’t overly impressed with holes 6&7 and the back-to-back par fives at 13&14, as they’re set in the flatter part of the property, but there appears to be work going on in that area to improve the visual aesthetics, with shaggy mounding and new gorse plantings framing the fairways. In time, the new vegetation will look easier on the eye, allowing the holes to blend into the landscape more easily. The sequence from 10 to 12 is really quite exhilarating, as fairways fight the contours in amongst the dunes, and this exciting topography is revisited over three of the last four holes at 15, 16 and 18. The par four 11th is probably my favourite hole, though, where the drive plunges down off the tee, followed by an uphill approach to a raised green. I also like having the home green situated right in front of the clubhouse, where all home greens should be sited! A brief word of thanks is owed to Manager John Mort, who gave me a good look around the magnificent old clubhouse, offering a proper explanation of the club’s Frank Stableford and Bobby Jones connections. Thanks also to Mike Adams in the pro shop, who glued my playing partner’s disintegrating golf shoe after nine holes, allowing said piece of footwear to be used for 54-holes of golf over the following two days! Hmm. Played it in the week of the Open and we were really looking forward to what was billed as a great course. It was a good course but playing very very tough and the course management on the day was poor by officials. The rough had clearly been grown up for the Open week in order to show what a tough track it could be and that led to a less enjoyable experience than it should have been and a ridiculously long round due to every group on the course spending so long looking for balls. After the relatively gentle first hole the next two were daunting and hard. Blind tee shots to narrow fairways and balls were gobbled up in the rough. By the time you got over the hill to see wider fairways spirits were low and ball supplies lower. I can safely say I found it the most penal links course I have played, and I've played all of the Open rota but Troon. The greens were in great condition and it got more playable as the round went on but it was just not as enjoyable as it should have been. It took everyone over 5 hours to play a round by mid-morning tee offs and that was just too long. Shame really but the penal nature of the course stopped it being much fun. A beauty of a links course. Played here with my best friend last summer on a trip to Liverpool.Charming club house, especially when viewed from the approach up the 18th coming into the green. Nice welcome in the pro shop with a few tips for a few holes.Some classic holes, punishing rough & undulating fairways. The first par-5 on the course gives you a fantastic view out across the water tempting you to let your concentration waiver as you wind up for a long drive. Wind & firm greens make you create shots at Wallasey & like most fine links course accurately off the tee is the difference between enjoying Wallasey & leaving feeling beat-up. If you are feeling a little off with the ‘Big Dog’ when you visit I suggest leaving it in the bag in favour of a club you know you can hit the fairway with. Anyone who has stood on the tee box on the 3rd hole in strong wind will know what I mean. All in all a must visit if in the area & more than holds its own with some of its more famous neighbours.